The background of a design is the foundation on which everything else is built upon. It can be a subtle texture to give the design a tactile appearance, a cute pattern to set the theme of the design, or it could incorporate stunning artwork to catch the viewer’s attention. 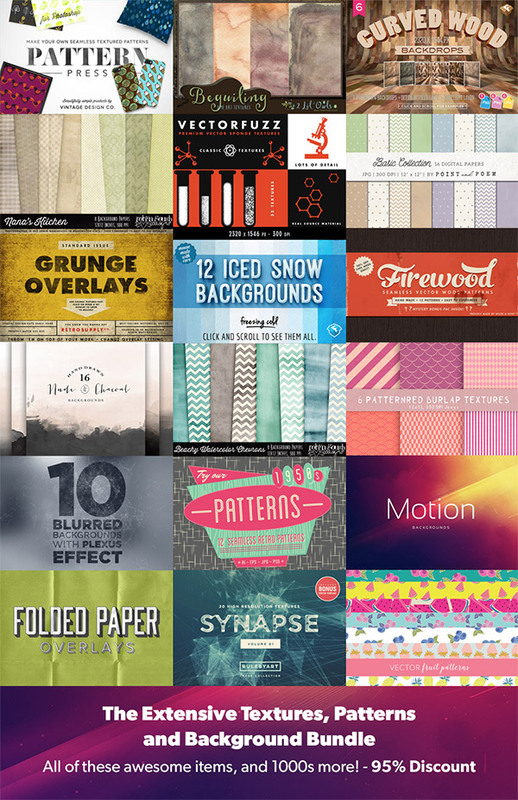 This new limited time bundle from Design Cuts contains all the different types of backgrounds you could ever wish for with its compilation of best selling textures and patterns. A lot of the items are rare types of resources too, such as the complex polygon backgrounds that require complicated 3D tools to produce, or detailed artistic patterns in super high resolution. 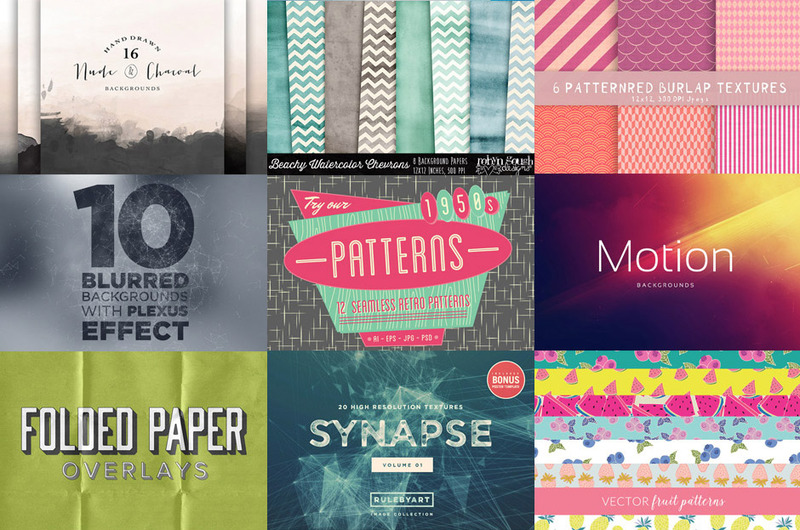 This entire bundle contains countless textures, patterns and background of various types and styles. There’s plenty of popular resources for every day projects such as high resolution paper textures and illustrated vector patterns, but also some rare abstract items that are the key ingredient to create stunning artwork for the right project. As always, their massive 95% discount makes this deal unmissable, especially when you consider the value of the free extended licensing, which allows you to use these resources in your commercial design work and artwork you intend to sell. There’s a vast range of backgrounds, textures and patterns in this collection which means there’s too many to feature in my review, but here’s a selection of some of the products that stand out to me. These complex textures from the Synapse kit are the perfect background for abstract designs. The mockup previews show how they help create stunning artwork for club posters or album covers. At 4000x3000px and 300dpi they can easily be used in large format print projects. Creating seamless patterns has never been so easy thanks to PatternPress. In just a few steps you can create cool artwork that can fill any area, complete with texturing and stamp effects. This is great for cute art prints, customised tote bags, notebook covers and endless product possibilities. This selection of 6 Curved Wood Backdrops is one of the more unusual items in the bundle, but it’s extremely useful for creating an environment for website header images or product advertisements. Place your item onto the backdrop to produce a cool realistic scene. Backgrounds can either form a focal point of a design, or they can provide subtle textures to enhance an image. These Floating Dust Overlays add a finishing touch to any photograph with a range of blurred particles. Watercolour textures are super trendy at the moment. They’re great backgrounds for artistic products such as cards or journal covers, and they also help bring your typography illustrations to life with a combination of rich colours and textures. My review is just a small sample of the full range of products available in The Extensive Textures, Patterns and Backgrounds Bundle so I’d highly recommend you check out the full overview page to see everything on offer. The extended licensing is especially valuable when it comes to texture resources because they’re always a main component of a design. Knowing you can safely use them in your client work and in products you intend to sell provides opportunities for all kinds of fun projects! This deal won’t be around for long so make sure you grab this 95% discount before the offer expires on Monday 29th June. Designcuts again proved that they are best graphics deal providers out there. Recently conducted the interview from the owner Tom Ross and found out they have great team! This pack is really great! Thank You chris for another share! Background textures are a great way to give depth and originality to here are the best places to find more free background textures.. Subtle Patterns provides textures to use directly onto web-related projects.